MANILA, Philippines — Canadian singer and songwriter Daniel Caesar visited Tarlac City ahead of his July 23 concert at the New Frontier Theater in Quezon City. Caesar, whose real name is Ashton Simmonds, is also famous for his single “Get You,” which garnered over 10 million streams on Apple Music and for which he got a Best R&B Performance nomination at the 2018 Grammys. Tarlac City Mayor Cristy Angeles shared on her Facebook page a video of Caesar’s recent visit. “I would just like to express my heartfelt gratitude and appreciation to the Canadian singer and songwriter, Daniel Caesar, for visiting me at the Mayor’s Office despite his busy schedule in preparing for his solo concert that will be held in the New Frontier Theater in Manila on July 23,” Angeles said. 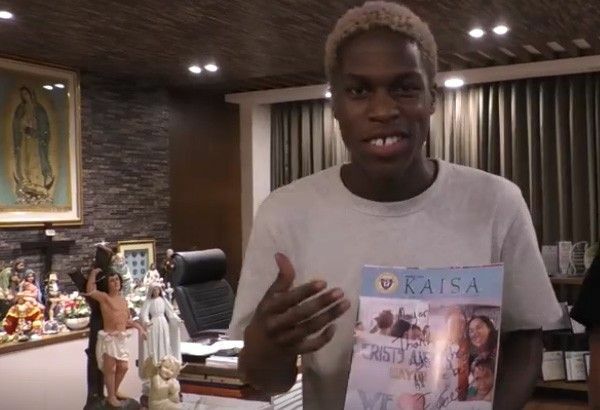 “Daniel Caesar is a Grammy-winning artist known for his modern R&B and electronics music while his lyrics explore the subjects of religion and unrequited love. Some of his remarkable songs are Get You (feat. Kali Uchis) and Best Part (feat. H.E.R.) which garnered together more than 453,000,000 Play Counts at Spotify as of date,” the mayor added. Caesar also documented his Tarlac visit in his Instagram stories. He showed videos and pictures of him living like a local — eating Jollibee and drinking San Mig Light, riding a tricycle, playing basketball with kids, and listening to Filipino rap legend Francis Magalona on Spotify. He tagged Filipino-American artist Keavanx in his Instagram story. In an Instagram post, Keavanx said he brought Daniel and his other friends to his ancestral home in Tarlac City. this is my tita glo’s flower shop in tarlac. infront of the house my mom and her 7 brothers & sisters grew up in. the ancestral home. today i got to bring my dawgs here. it was special. the mayor told me “this is now your home” & said she can help expedite my citizenship lol. life is jokes. always love. ? ?